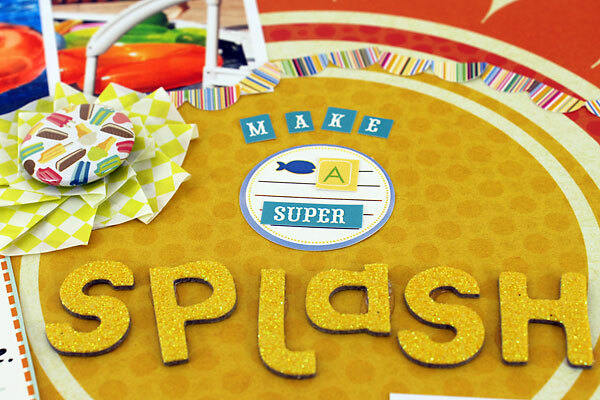 Leah's Crafty Life: Make a super splash! Holy moly.. it's been three weeks since I've blogged, and they go and change things on me... funny how I think about blogging, but I don't get my rear over here to do it. Time to make me a priority again. I can easily get lost in the space of other things, and forget to do what makes me happy. 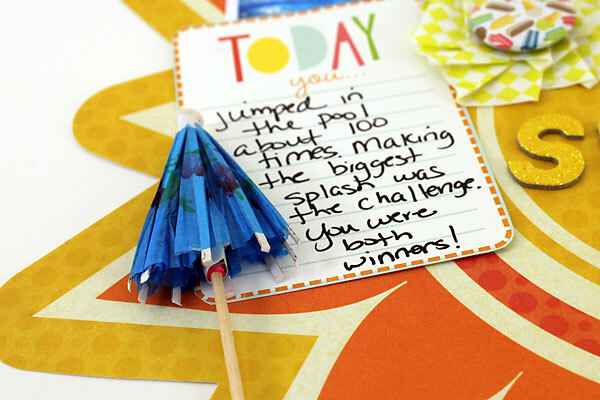 Speaking of happy.. Paper Issues has a new blog prompt up. It's SUPER perfect for the record high temps we've been experiencing lately.. goes great with water, lemonade, and picnics by the pool... called, Make a Splash. Head over there and link up your creations and get inspired by others too... it's a win-win for everyone. Here's what I created. I used some iphone pics and this cute Noel Mignon kit she sold back in June. The paper is from We R Memory Keepers.. I thought it was just adorable. I photographed this in my lightbox... so I left the shape by itself and let the photos fall of the edges a bit, i think it's playful. Love the glittery alpha and pink paisley tape. And Might I add, I'm a HUGE sucker for these little paper umbrellas. I lurve them so much!!!!! I have scrapped three layouts in 24 hours.. holy cow, new record for me as of late. I'll share tomorrow, right now it's time for dinner and Bingo on facebook. Love your layout - so bright and colorful and I adore all your embellishments and banners!! Your photos are great!! I love how you used that diecut page as background and let elements sticking out!!!! What a fun page!!! super awesome page Leah! I love the title in the middle and ooh the sun! !